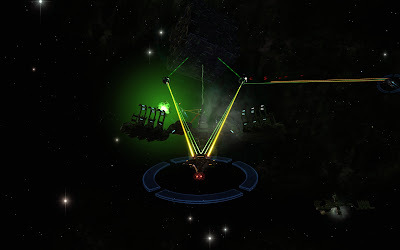 Star Trek Online recently gained a new loot drop that has been generating strong opinions, a Cardassian Lock Box. Inside each lock box is a random item. Possible items include a special tribble, some special team commodities, some cross faction consoles, a DS9 uniform set, or a few others. On the whole people aren’t interested in those, the only item they actually want is the Cardassian Galor class cruiser. The actual odds of getting a cruiser are unpublished but assumed to be very low, possibly in the 0.5% range. This wouldn’t be very interesting in itself without one final piece to the puzzle: you require a “Master Key” to open the box and the keys have to be bought on the C-Store for real money. They cost 100 c-points each, or 10 for 900, making them £0.72 each (I think). Many people have complained about this, and with some justification. My post isn’t really going to touch on that. Instead I’m going to reveal that I got one, and without spending any money on keys. You see, the ship is tradable via the exchange for normal in game energy credits. When it first launched prices were around 500 million. In three days they were down to 100 million. I snagged one for 82 million. This amount of in game cash is not a small amount by any means. In fact when I bought it, 82 million wass the most I’ve ever had at once, but at level cap there is very little else to spend energy credits on. There are also a couple of ways to earn a lot quickly. The first is Ker’rat. 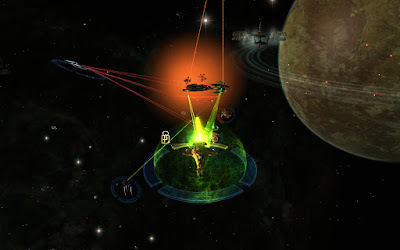 It’s a space warzone in Eta Eridani that features the Federation fighting the Klingons while simultaneously trying to complete some Borg related objectives. If you can win the warzone you get a very rare drop. If you’re second or third you get a rare drop. If you’re at max level the drop will be at least mk X, sometimes even mk XII. Also, all the ships you destroy drop loot in the mk X to XII range. The second way is STFs. Most STF runs on normal succeed with the optional these days. They also drop quite a bit of loot now (especially Cure). Between those two methods you should be able to amass your millions with relative ease (I had 40 million when the Galor was first released and reached 82 million in a week). Also, as an extra bonus, Ker’rat has a wrapper mission that gives you 1440 dilithium for every three completions (and is not a daily so you can just keep running it). Next postGravitas has been released!